The single most important and disruptive change in food culture, now winding its way through virtually every part of the industry, is the overwhelming desire for fresh foods. Call it the quest for all-things real. Fresh is defined as unprocessed, simple ingredients and often refrigerated. Fresh also conveys to consumers higher perceived quality, better taste and healthier. And so the packaged food world finds itself facing a state of transition as fresh versions overtake and replace their processed cousins. A.T. Kearney/Hartman Group study “Is Big Food in Trouble?” tracks growth of fresh trend as the dominant shift in consumer preference. Why are meal kit solutions taking off so rapidly? Because they fit with fresh – offering real food ingredients already portioned and curated for menu creation. The meal kit is a form of convenience and taste adventure that connects to the consumer’s desire for experimentation. Thus, meal kits sit squarely on cultural relevance driving the fresher, higher-quality ingredients business. The emerging fast casual restaurant sector is symptomatic of the fresh revolution and move beyond fast, cheap and common foods that have dominated the QSR category for decades. Fast casual’s emphasis on open production, customizable, made-to-order foods using fresh ingredients is relevant and in sync with consumers’ interests for higher-quality, healthier food experiences. Grocerant strategies: all of this should instigate change at food retail to elevate Deli menus, think creatively about prepared foods sold for take-out, and improve in-store dining experiences. 1. Investment in culinary-trained commissary staff and fine dining experienced chefs in leadership positions (Chief Culinary Officer). 2. Open kitchens and preparation spaces to show ingredients and allow for customizing menu items. 3. Reworking Deli menus to add more creative, global influences to prepared food options, beyond the comfort staples like meatloaf and rotisserie chicken. 4. Creating improved in-store signage and merchandising that will alert shoppers to fresh, in-season, locally sourced products. 5. Building content and storytelling around locally-sourced ingredients, farmer profiles, as well as tangible investments in local agriculture. 6. Cooking classes to inspire improvements in culinary skills and adoption of chef techniques for the home kitchen. 7. Better designs and environment for dine-in spaces inside food retail. There are those who simply love and enjoy food shopping – call it a sort of culinary catharsis – and want to visually experience the fresh options arrayed in front of them. Shopping at the store is, for some people, a type of food religion observed with regularity. For others, convenience must address the demands of busy lifestyle where online ordering is a valued (even required) option. Mobile-based ordering platforms – in web and app form – are not peripheral but rather integral to the food retail eco-system. We believe e-commerce will be a factor in fresh product sales. Increasingly, consumers are getting used to the process as orders continue to meet and exceed their quality and freshness expectations. 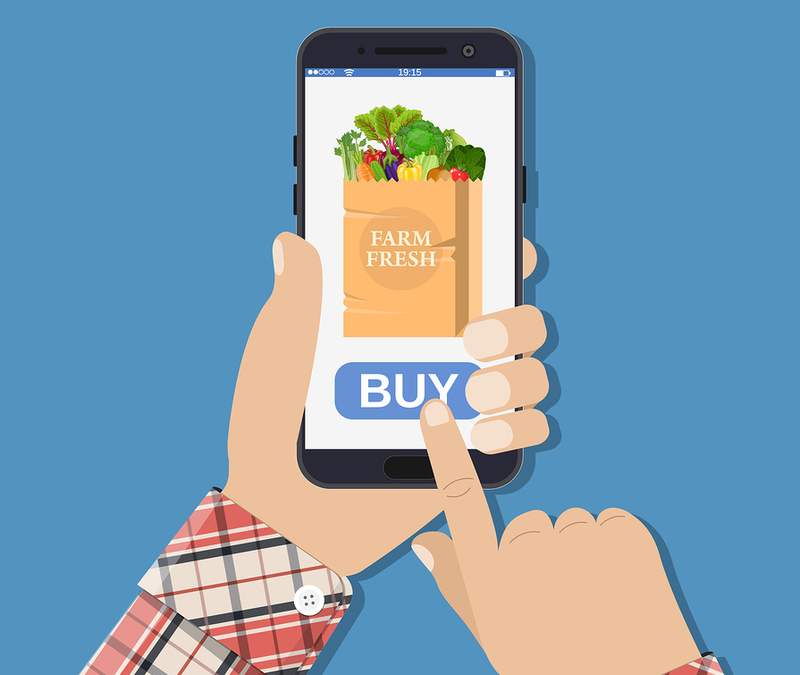 Where the e-commerce play becomes a real exciting opportunity is when local sourcing can be woven together with digital ordering and delivery – such that time between farm and dinner table is shortened considerably. As digital sophistication increases, another game changer would be the ability to solve and resolve last-minute ingredient or recipe needs (where rapid ordering and delivery is required). There is no other consideration more relevant, important and powerful than the groundswell towards healthier lifestyle. While healthy food was at one time attached to diet products, the meaning has changed considerably. Foods made from simple and less-processed ingredients continue to gain traction, while better-for-you snacks are encroaching on more indulgent rivals. Insight: we are moving from a production-fueled system to a demand-driven system, founded on the consumer’s interest in real foods and a parallel desire to know more about ingredients, sourcing, transparency, and sustainability. How brands and retailers respond now will have great bearing on their relevance and success later on. Emergent’s strategic planning capabilities are designed around this agenda: marry insight to optimizing growth strategies and translating this work to more effective communication. Kitchens have fully transformed and left behind any vestiges of being the labor-focused food prep station of yore (orange cone work zone). Instead, the room has morphed to become the most dynamic and influential household space. It’s the heart of the house – where social interaction and connection, entertainment and media consumption, healthy lifestyle expression, and food adventure all coalesce. Life unfolds here on so many levels. When exactly did the kitchen move from cooking conclave to heartbeat of healthy living? The origins can be traced to a cultural shift sparked by the Internet age in the late 90’s and the dawn of ‘anything that can be known will be known’ – ushering in the era of consumer control. The digital revolution allows people to indulge in unprecedented access to information about fresh food, industrial food, ingredients, sources, preparations, cooking techniques, and the impact of our food choices on both ourselves and the environment. Fanning this spark to disruptive blaze is the unstoppable premiumization of food experience in America; a massive light bulb moment that what you eat directly impacts the quality of your life. In sum, the consumer’s desire for higher quality food and beverage experiences goes along with their higher quality lives. Let’s face it – food is just super popular. Think Food Network, celeb chefs, food bloggers, food trucks, meal kits, cooking schools, the move to fresh and local over packaged and processed, culinary vacations, gastropubs, even school food – virtually everywhere food quality has gone up. Except on your average airline. There is an equally intense desire to invest more time in an environment we can control while the world outside roils with uncertainty. This condition has helped catalyze a resurgence in cooking skills and culinary exploration; helping fuel the deepening bond between satiating our more sophisticated sensory interests and desire for more social attachment. In fact, it is the intersection of media, food experience and the social aspects of food consumption that has transformed the kitchen area to lifestyle retreat. At one point in time, healthy was ascribed to calculations of addition by subtraction. A food focused trip to ingredient eradication in service of less – sodium, sugar, fat, and calories. Healthy is no longer just a food-centric science experiment. Instead, it is a way of living that mirrors the consumer’s interest in a more fulfilling life. Know more, be more and do more. Live better, brighter and longer. Yes, we’ve connected the dots between what we consume and do and the outcomes on health and happiness. We’ve rediscovered the true path to improved and more interesting food experiences through experimentation in the kitchen. For this reason, we increasingly prefer to have home prepared meals over dining out – for its creative inspiration, control over experience, and ability to manage ingredients to our specs. The kitchen is now an environment that bridges media and entertainment interests with family and social interaction. We’ve come to appreciate a more holistic integration of mind, body, and spirit. We recognize how our choices and decisions impact the direction we take, experiences we have. The implications to marketers working in and around this area in the home are deep and diverse. How can brands become enablers of creativity, personal expression, learning achievement, social discourse, family life and relationship growth? Healthy living is more than a commitment to exercise. It’s a desire to follow a path to improved happiness and satisfaction. Brands that position themselves as facilitators of healthy lifestyle and provide resources, information, and easy-to-use tools will endear themselves to this ever-growing, engaged and active consumer base. This is rich territory for social and experiential content and brand community building – enlarging the brand voice to rise above feature and benefit selling, to become a true partner in consumers’ lives. Oddly enough, letting go of traditional sales thinking can achieve authentic engagement and real traction. What’s more, we unlock a treasure trove of relevance to consumer’s lives and what they care about. If brands can become a genuine healthy lifestyle coach, then we can also earn permission for a relationship built on trust and reciprocity. The creative wheels should spin on elevating kitchen strategy – designing a viable footprint in this area of the home that fuels emotional lifestyle aspirations over tech specs. Just exciting. We sit in service of the whole human being, not just the stomach. Is this embedded in your marketing plan? Belief is now central to closing the deal with consumers – to earning their allegiance and engagement. Yet, belief and its sibling trust are often not acknowledged directly in marketing strategies, priorities and especially downstream business behaviors. We already know consumers are fully in control of initiating any conversation (pull) with brands – while traditional business, marketing and media strategies (push) have been upended by cultural shifts and technological disruption. Trust, relevance, and consumer-centricity have become foundational to growth because they mirror consumer expectations, and thus inform brand preferences. Of all the business priorities clamoring for attention, it now falls on CMOs to become belief managers – working (harder) to build trust between consumers and brands in a business environment where skepticism rules. Today, the marketer’s goal is to transform customers into advocates and ambassadors. But to do so first requires belief. Trust is difficult to secure and challenging to preserve. It springs from a point of view that brand relationships are really like friendships, and so trust must be earned and nurtured through actions not just words. The bargain for Belief Management is consumers determine you are operating in their best interests, that you are devoted to quality and craftsmanship; that your business operates with real values, a tangible soul and is making an effort to improve the world around us. There was an era when marketers felt they could control and transact belief by ordering up paid influence through advertising imagery, music, message done in an effort to persuade. Now the artifice of concocted, self-promoting story is running headlong into a reality test. The consumer isn’t listening. They are, however, listening to each other – thus ‘social proof’ is a major part of the belief acid test. Be an enabler and supporter. As you read those statements, they sound oddly familiar – as in the type of human behavior that leads to trust and friendship. The more brand relationships mirror characteristics of human friendships the better this gets. In the marketing plan, belief must manifest in every step the organization takes to put the consumer at the center of strategy. 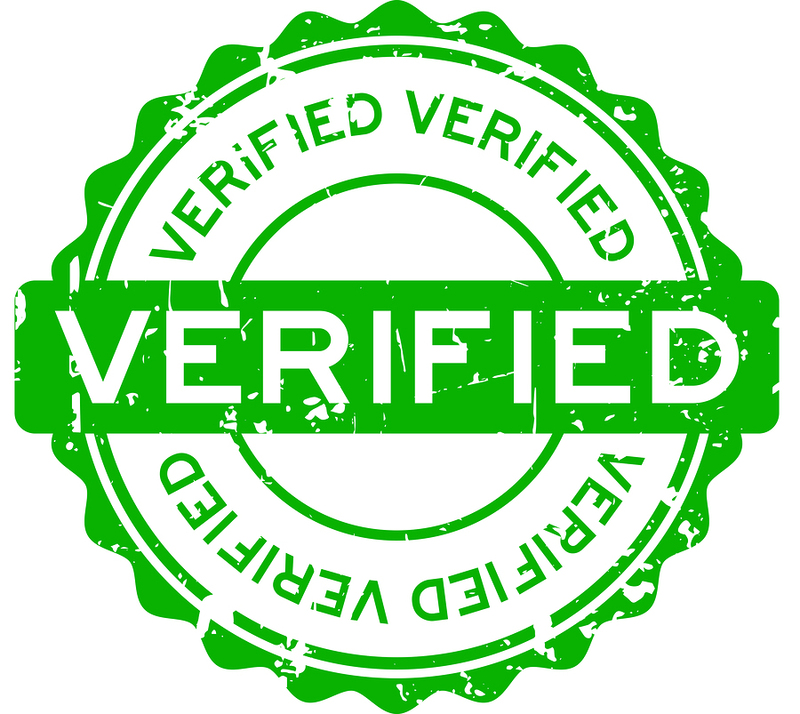 That said, with consumers increasingly skeptical of corporate motivation, the pressure is even greater for brands and retailers to not only represent themselves as authentic, transparent and trustworthy – but TO BE authentic, transparent and trustworthy. This is why Higher Purpose is such a vital component of installing belief. To the extent the business is shaped and guided by a legitimate belief system that steps beyond the transaction and profit motive, the deeper meaning and values help facilitate company behaviors that ‘prove’ a customer-first commitment. It should be noted, there’s also a stark reality. In today’s connected world where ‘anything that can be known will be known,’ brands now live in glass houses. Honesty as an imperative is fueled by the reality of hyper-connectivity and the ability of consumers to rapidly obtain information in real time, confirming or denying, what your company does and does not do. At Emergent, we started work awhile back on a new planning model. We call it Validation Marketing. We created this series of steps with one fundamental concept that sits underneath: it is a trust creation engine. 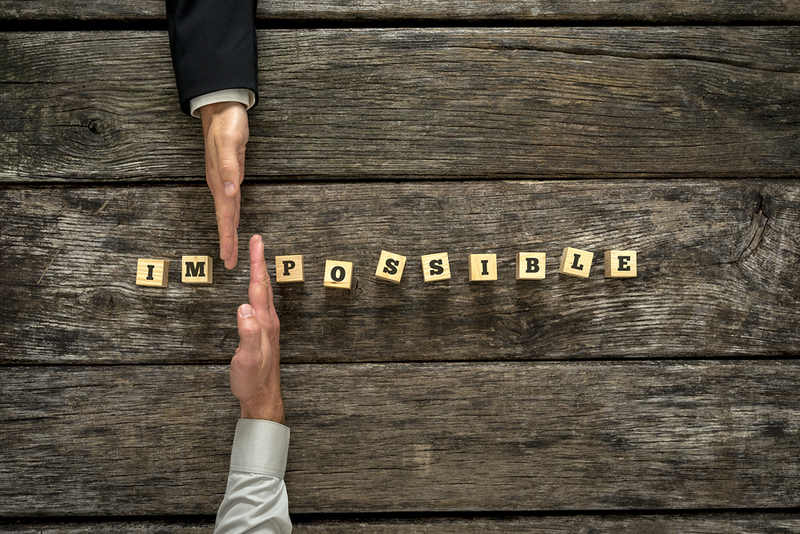 If you accept the idea that belief and trust are vital to getting “permission” for any kind of relationship with those that buy from you, then this recipe for belief creation is for you. It is a virtuous circle. As belief managers we establish the foundation for engagement, working hard to build relevance and deeper meaning with consumers. Why? Because we’ve, in effect, humanized the entire operation and, in doing so, created the basis for trust. For food retailers, if you follow this thinking all the way to the ground of shopping experience, there’s an opportunity to elevate and differentiate the banner brand. Legacy policies suggest some lack this insight or are unable to translate customer-centricity all the way through to offering food adventures in an environment that is traditionally focused solely on pushing transactions. The irony: transactions will be better served by working harder on belief management. Interested in learning more about harnessing the power of brand purpose, developing belief strategies and becoming the beneficiary of consumer trust? Watch the webinar we hosted with Fresh Squeezed Ideas on the “Power of Purpose.” Moderated by the Food Marketing Institute’s (FMI) Mark Baum, the webinar features Emergent’s Bob Wheatley and Fresh Squeezed Ideas’ John McGarr, a premier consumer insights provider. Just returned from the Food Marketing Institute’s Midwinter Executive Conference in Scottsdale. A remarkable gathering of food retail CEOs and CPG C-suite officers who come together once a year to network and compare notes on the future of the food business. Kevin Coupe, author and owner/producer of the Morning News Beat and I were chatting about the hurdles to change in food retail. Made tougher when the business model based on razor thin margins and velocity/volume runs headlong into a consumer desire for greater service, culinary experiences and higher quality real, less processed food adventures. 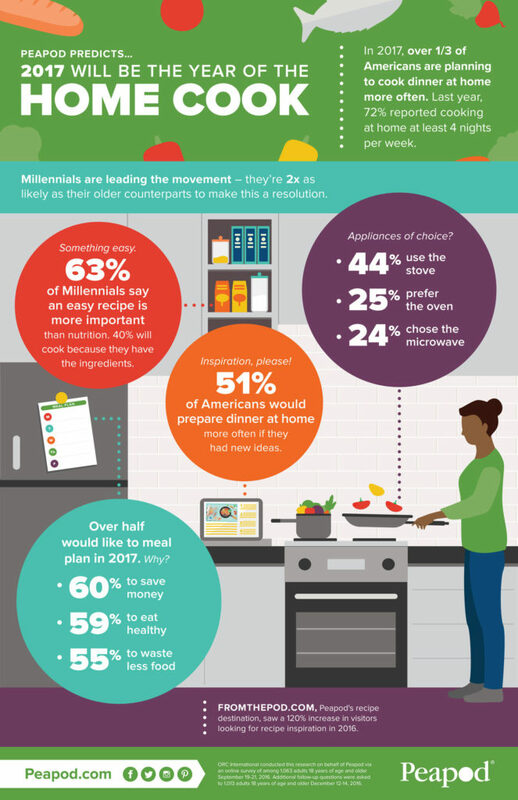 I think it’s safe to say the food and beverage industry is in a state of transformation as food culture shifts impact what consumers want and how they engage with both product brands and retailers. But change is hard if you’ve been following a certain strategic recipe for decades. And the rules and conventions of business are just so familiar it’s challenging to walk past the comfort zone of what you think you know. In a manner of speaking, it’s difficult to follow the beat of a different drummer. People have changed – their wants and needs, how they engage with brands, their media preferences, their attitude about food and the things that motivate purchase or how they form relationships with brands and retailers they care about. If your own corporate culture follows a relatively predictable path, then planned disruption may be necessary to alter course and, yes, Think Different. The story of Apple’s transformation in 1997 is one of disruption and evolution. For more than a decade prior Apple had been through an identity crisis that started in 1985 when Steve Jobs was drummed out of the company he started. Following Apple’s merger with NeXT, Jobs returned to the fold as interim CEO. During that time the tech business was defined mostly by desktop computers and the software that powered them. When Jobs got control he wanted to re-introduce the brand while ushering in a new hardware era where design and user experience considerations were as important as the technology. And in doing so, he repositioned Apple differently against the other beige boxes in the competitor set. Lee Clow was the TBWA\Chiat\Day creative executive behind what many consider to be the best TV commercial ever produced, Apple’s “1984” Super Bowl spot – created to introduce the Macintosh. After a decade long hiatus, Clow and colleague Rob Siltanen were invited to meet with Jobs to discuss his objectives. This meeting would ultimately lead to the renaissance of the Apple brand and its emergence as one of the most successful corporate turnarounds in history. What’s important in my mind about this isn’t so much the ad campaign. It arguably set the company on a new trajectory, but more so the thinking and influence the message had within Apple and popular culture. 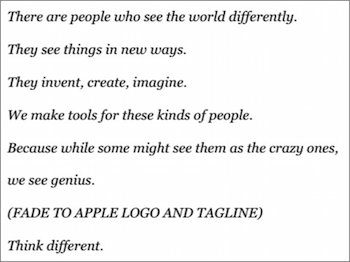 Clow and Siltanen brought a video to their presentation that helped cast the thinking behind “Think Different.” Essentially, it was a way to put Apple in league with the great disruptors in history who’ve created change in one way or another in science, the arts, their careers or life pursuits. Albert Einstein, Mohammed Ali and others were employed as the iconic examples of “Think Different.” Please note this communication did not focus on features or technical advantage. There was no buzz on chips or memory capacity or screen resolution and lower prices. Instead, it was a clarion call to the creative community and others who see themselves on a different path, that this is the non-computer computer company for you. The bold move to pick a position and bravely stand on it was unexpected, unusual and flew in the face of conventional thinking in how you make the case for these products. Perhaps Job’s best move was to put user experience at the top of his business agenda and drive hard on that point of view through every innovation and strategic move they unleashed, including Apple retail stores – a unique experience in themselves. 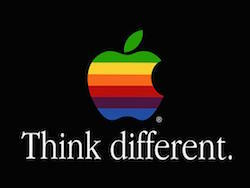 “Think Different” expressed a point of view. It went past the obvious of tech and specs and focused instead on the ambitions and desires of all the game changers out there who want to leave a mark on the world. It was, and is, inspirational. 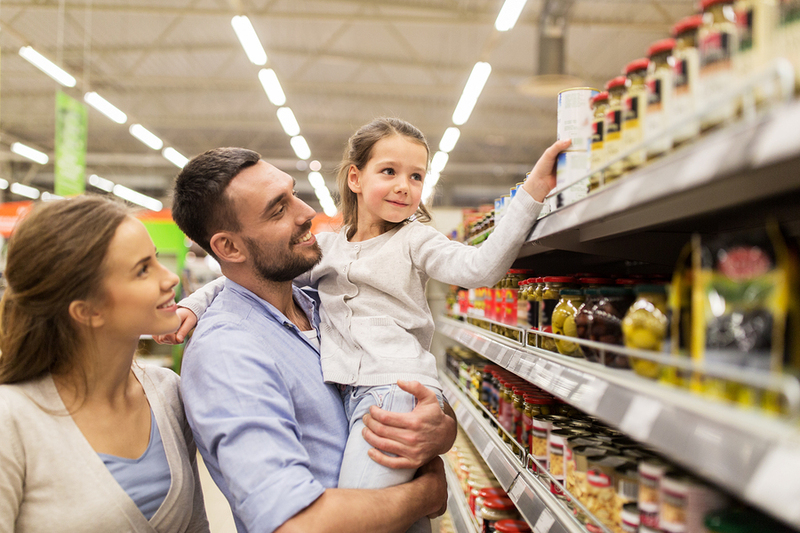 Unlike CPG brands that must focus on message, social community and content to engage their audiences, food retail has the awesome advantage of real-time live experience to bring the level of engagement up a personal notch. How can the food retail experience be disrupted and thus changed to alter the perception people have of the banner(s) they prefer? What can be done to better develop culinary inspiration, guidance on health and wellness in ways that alter what happens inside the front door? True innovation is more than a signage proposition. It requires putting the consumer at the center of business strategy, investing in insight discovery about their wants, needs, concerns and aspirations – and working backwards from there. That, by the way, is what we do. You can destroy ten years of retail equity and loyalty in five minutes. Failed policies and poor training can set in motion what we affectionately refer to as the spiraling vortex of doom. Jeans. I wear them everyday, and for the shift to casual attire in business I thank the gods of cultural change. So jeans are a thing for me – an essential wardrobe component and thus a sartorial priority. I care about my jeans. 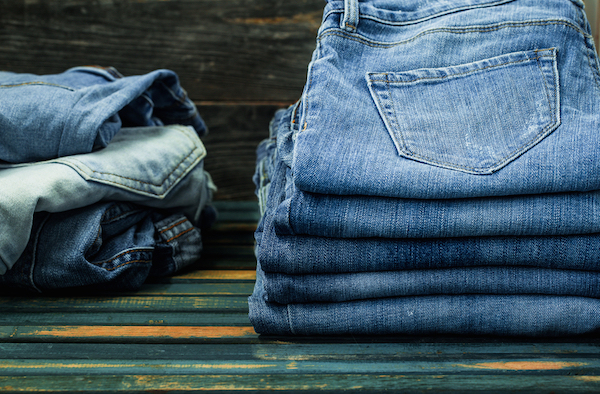 I have been a decade-long exclusive and devoted customer of the Lucky brand of jeans. I like the fit, the price, the color options – and their retail store is just a few minutes from my home – so convenient. For these attributes I have rewarded Lucky with my jean purchases for more than 10 years. I recently got a pair of Lucky jeans as a gift from my wife, who knows my preferences for the brand. But the size wasn’t right and the fit choice not my favorite. So I went back to the store to exchange for another style. The clerk saw me walk in with my pair of jeans in hand and the scowl on her face suggested she might not be pleased to see me. I explained my need and she asked for a sales receipt. I said I didn’t have one as it was a gift. But all the assorted tags and stickers were still affixed including price tag thus it was clearly a brand new, never worn pair. I further explained that I just wanted to exchange for another style and would be happy to pay any price difference as needed. She said she couldn’t help me because no jeans of the size I wanted existed in the store. Now please know I’m not a doormat in these situations, and made it clear I would like to find a solution. So the manager is enlisted – he tells me the store location is closing, that remaining inventory is to be sold off and thus why my size isn’t and won’t be available. I ask for a credit I can use for an online purchase. He says he can only give me $12 (they cost $100) for the jeans because that’s the policy when closing out store inventory. The discussion goes on as I attempt to talk them into finding a creative way to make me, their decade long faithful customer, happy. Nothing doing. I said: so you’re telling me I’m screwed? Manager: pretty much. I left with my wrong jeans in hand. It was policy he said that dictated the intransigence. Most of the time we don’t consider the where’s and why’s of our loyal behavior other than the ability to execute a pleasing purchase. Within five short minutes the friction filled in-store experience abruptly ended 10 years of brand preference and loyalty. I wondered how many other customers had been ‘touched’ by this unlucky brand of policy punishment. If customers are merely walking wallets and the relationship is purely transactional then the future will belong to e-tailing where algorithms remove the human issues. If retail is to be successful, customer relationships must be looked upon with the greatest respect and cherished completely end-to-end in operations and the care and feeding of customer experience. The recipe for improvement here begins with drinking at the cultural well of customer devotion. When the company ethos and mission are embedded in building lasting relationships with those that walk in the door, the behaviors at point of sale will go more smoothly through the ups and downs of business change. Training can’t be underestimated or underplayed as a vital link in cultivating the right customer experience. Well-trained employees present the face of the brand and influence the perception of value and being valued. Finally, policies can help or ultimately destroy brand reputations. Policies that are not customer-friendly virtually guarantee outcomes of unhappiness and separation. Jeans are not purchased; happiness is. And unless this concept of where value truly exists takes root fully inside retail organizations, it will be harder to keep the brick and mortar system healthy in the face of online convenience and frictionless digital purchase. Brand franchises are built on the feelings people have while in the presence of a brand or retail banner – so this key factor in the relationship should be respected.